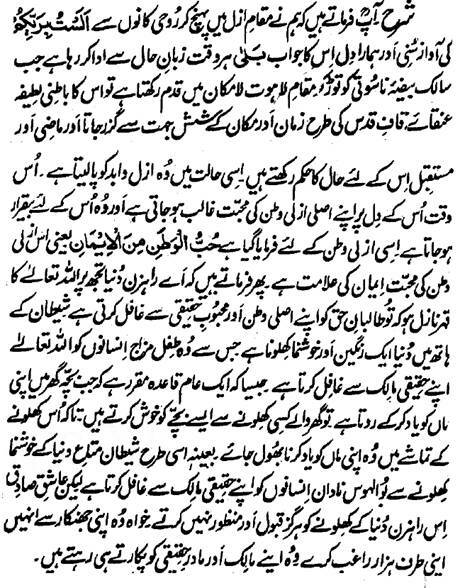 Hazrat Sultan Bahu Rahmatu-Allahe Ta-aala Alaihe says that the Violence of Lord should fall on this brigand Dunya (World) as it strays the Seekers of Haq away from their original Homeland and the Real beloved . Dunya (World) is a colorful and attractive toy in the hand of Satan by which he makes the childish people heedless from Allah Almighty who is their Real Lord. It is a common practice that when a child weeps remembering his mother, the people of house give him some toy to make him happy so that he may stop weeping for his mother in the plays of the toy. Same like this, Satan turns the stupid man, who is capricious, neglectful of his Rightful Lord but the Truthful Aashiqeen never accept and honor this toy of the brigand Dunya (World) no matter how much it attracts and tempts them towards it through its tunes and pomp and remain in commemoration of their Lord and the Real Homeland.